Los Angeles County Sheriff’s Department (LASD) homicide investigators have learned that shortly after 12:00 p.m., Lancaster Station received a call of a residential burglary occurring at a residence located in the 3200 block of West Avenue J-7 in Lancaster. 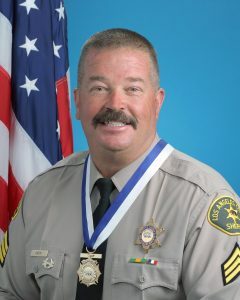 Sergeant Steven Owen, a 29 year veteran of the Sheriff’s Department, was the first of two responders to the residence. In an active attempt to preserve life and property and establish a containment, Sergeant Owen positioned himself to the rear of the location. The suspect encountered Sergeant Owen, produced a handgun and opened fire, striking Sergeant Owen. A second deputy arrived on scene and encountered the suspect who had entered Sergeant Owen’s patrol vehicle and was attempting to commandeer it. At that point, a deputy-involved shooting occurred. The suspect then rammed the assisting deputy’s patrol vehicle head-on before running from the scene. As a containment was established for the apprehension of the suspect, it was learned that the suspect had entered yet another nearby residence occupied by two teenagers. The scared teenagers then alerted the Sheriff’s Department that the suspect was inside their home, putting into effect an immediate rescue plan. Already on scene, a special weapons team from LASD’S Special Enforcement Bureau (SEB) made entry to protect the lives of the teenagers who were in danger. As SEB made entry, the suspect exited the rear door of the residence and less than lethal devices were deployed to ensure that the suspect could not re-enter. At this time, the teenagers were successfully rescued to safety. In a continued effort to avoid apprehension, the suspect then climbed over a wall where he was confronted by deputies from Lancaster Station. He was then taken into custody. The suspect, a male black adult on active parole, was struck by gunfire in the upper torso and transported to a local hospital for a medical clearance for booking. He is believed to be from the general Antelope Valley area. A weapon was recovered and although it is early in the investigation, investigators are not currently looking for additional suspects. Investigators continue to evaluate multiple scenes related to this crime and there is no additional information available at this time. During this difficult time, it is important to remember and appreciate the heroic efforts by those who are called upon to keep the peace. In this case, Sergeant Owen was killed in his efforts, making the ultimate sacrifice. Whenever a Deputy Involved Shooting occurs involving Los Angeles County Sheriff’s deputies and it results in the wounding of a suspect, multiple independent investigations immediately begin at the scene. These include separate investigations by the Sheriff’s Homicide Bureau and Internal Affairs Bureau. The Los Angeles County Sheriff’s Department immediately notifies the Office of the Inspector General who sends a representative to the incident scene and provides independent oversight throughout the investigative process. The mission of the Office of Inspector General is to provide strong, independent and effective oversight of the Los Angeles County Sheriff’s Department and to ensure transparent, accountable and constitutional policing for the County of Los Angeles. The Critical Incident Review panel convenes to perform a preliminary risk management analysis of the shooting. This panel is comprised of the concerned chief and unit commander, risk management and training personnel, the chairperson of the Executive Force Review Committee, and a representative from the Office of the Los Angeles County Counsel. Every aspect of a Deputy-Involved shooting is ultimately evaluated by the Sheriff’s Executive Force Review Committee, which determines whether there are any policy, tactical, supervisory, or training violations or concerns. The Office of the Los Angeles County District Attorney also participates in the investigatory process and conducts a legal analysis of the shooting. Anyone with information about this incident is encouraged to contact the Los Angeles County Sheriff’s Department’s Homicide Bureau at (323) 890-5500. If you prefer to provide information anonymously, you may call “Crime Stoppers” by dialing (800) 222-TIPS (8477), use your smartphone by downloading the “P3 MOBILE APP” on Google play or the App Store, or by using the website http://lacrimestoppers.org.